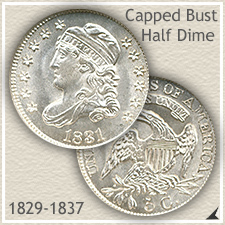 The Bust half dime value starts at $42 for the more often encountered Capped Bust variety of 1829-1837. 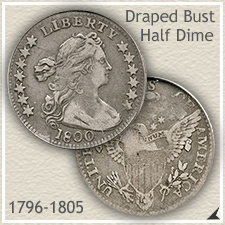 A classic valuable rarity, the earlier Draped Bust type is worth $848 or more. Scarce and desirable are traits shared by all half dimes. Collectors treasure these early pieces of US history, creating a strong demand. All dates are sought and special emphasis is placed on condition. Each coin is carefully judged of its condition and a "Grade" is assigned. With date and grade evaluated an accurate Bust half dime value is determined. It is exciting to see how much your coin is worth on the chart, however if well preserved, it is genuinely a rare coin from the past. The "uncirculated" Bust half dime pictured is a stunning, very valuable and collectible coin. Compare your coins to the Grading images below. True the highest values are reserved for choice higher grade pieces. None the less, solid, pleasing examples of all grades are avidly sought and collected. The above are wholesale coin values. Computed from dealer's price lists and auction results. Various wholesale factors are figured in to reflect closely the price you would expect to receive when selling. If your coin is not listed above, it is seldom encountered. 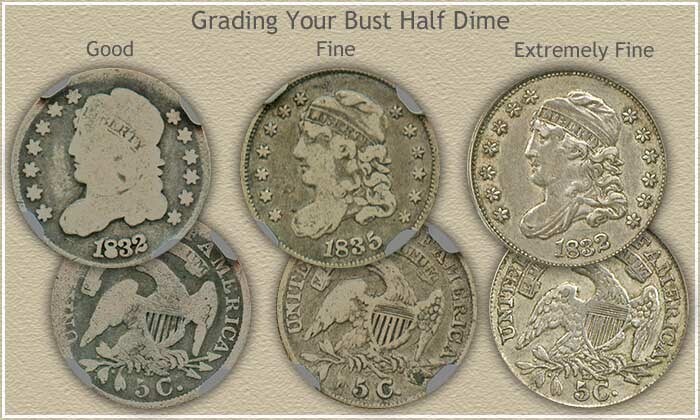 For additional reference... NumisMedia publishes an extensive fair market value price guide, covering retail Bust half dime value in detail. It seems these small silver coins were subjected to harsh treatment over the years. Many bust half dimes found today are bent, dented, holed, scratched or heavily worn. Determine an accurate value of your coins by comparing their condition to the grading images. As a coin circulates through commerce the fine details of the design wear away and merge. The degree of the wear separates one grade from the next and one Bust half dime value from the next. In "Good" condition a completely flat outline of Liberty's portrait remains. As more detail of her face and hair emerge the grade is elevated to "Fine". The valuable "Extremely Fine" grade is distinguished by less wear evident on the high points with a rounding of the hair details showing. Often the difference in value from one grade to the next is significant, and if you are not sure of the grade, help is available. Coin grading services are available to render a professional opinion of your coin's condition. These services authenticate, grade and encapsulate your coin, allowing you to receive the highest bust half dime value. A dedicated group of collectors and dealers enjoy these numismatic treasures, forming a strong value base. There is always room for one more collector, you are off to a good start. Perhaps consider your box of old coins as the beginnings of a collection. 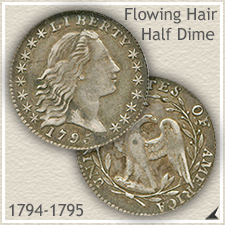 Historically significant, scarce, and with values trending upward, Bust half dimes are an important part of the hobby. Return to the index page leading to the rest of the half dime series. Including value charts, grading images, and mintmark locations. Coin Values Discovery... finds Bust Half Dime Value and... All old US coin values. It is an excellent index with images and text links to all coin series, from Cents to Gold. Value charts, grading images and descriptions uncover how much your box of old coins is worth. 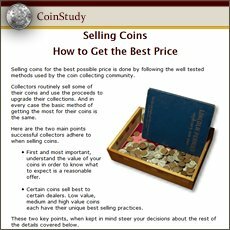 Print the handy Coin Values Worksheet - link is in the navigation column - to list your coins and record the values of your Bust half dimes. Should you decide to sell... use the worksheet as an invoice and packing slip when sending coins through the mail to dealers. It indicates you have done your coin values homework.